I find myself saying that a lot. Clever people come up with clever ideas and the rest of us are just left in the dust thinking inside the box. This might explain the lack of original content on this site, but that’s a topic for another day. 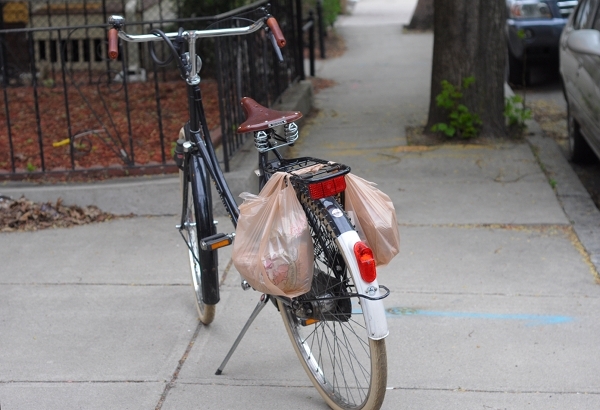 These ideas usually come from BikeHacks.com, but today this one comes from a great blog called LovelyBicycle!. So simple is this trick that it can be used by anyone with a rack. She does mention that you can also do this with reusable grocery bags, but if you remembered to bring bags in the first place you would not need this trick. Hop over to her blog to read more. Be careful with the eggs though.